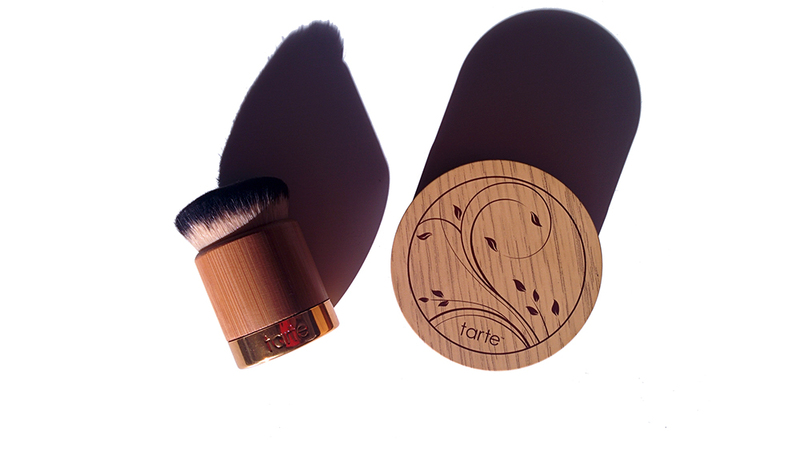 Up for review is Tarte's Amazonian Clay Full Coverage Airbush Foundation. While I'm usually a liquid foundation kind of girl, I had the urge to try a powder foundation since my face is rather oily and thought that a powder foundation would last longer on my skin. I wanted something light on the skin while offering good medium coverage as well. I'm happy to say, Tarte's Airbush Foundation does exactly that! Amazonian Clay Full Coverage Airbrush Foundation delivers flawless, natural-looking coverage that lasts, while the skintuitive™ formula invigorates skintone and texture for a youthful complexion. Powered by Amazonian clay enriched with the earth’s natural, light-reflecting gemstones, this talc-free, moisture-rich powder buffs on smoothly for waterproof, 12-hour coverage that won’t settle into fine lines and wrinkles. Available in an array of shades to perfectly complement a wide range of skintones and undertones, this innovative foundation also employs a custom mesh delivery system for a fool-proof, mess-free application every time. All shades (except rich sand): Quartz, Ruby Powder, Tourmaline, Caprylic/Capric Triglyceride, Smithsonite Extract, Sea Salt/Maris Sal/Sel Marin, Hydrolyzed Pearl, Camellia Sinensis Leaf Extract, BHT, Kaolin. May Contain(+/-): Titanium Dioxide (CI 77891), Iron Oxides (CI77491, CI77492, CI77499), Ultramarines (CI 77007), Zinc Oxide (CI 77947), Manganese Violet (CI 77742), Chromium Oxide Greens (CI 77288), Chromium Hydroxide Green (CI 77289), Bismuth Oxychloride (CI 77163), Ferric Ammonium Ferrocyanide (CI 77510), Ferric Ferrocyanide (CI 77510). Swatched on the right side of my hand. I'm just going to start out by saying that I really like this foundation! The first mineral foundation I ever used was Bare Minerals. I stopped using Bare Minerals because the powder didn't sit well on top of my skin. The powder started accentuating all my pores, "fine lines" (I was barely a freshman in college) and that's when I switched to liquid foundations. Flash forward to now, Tarte's foundation is the first powder foundation I've used in years. I was drawn to it because it specifically said it wouldn't settle into fine lines and that it was a "moisture" rich powder. I don't know about it being moisture-rich, but I would say that it is more finely milled than Bare Minerals was, and it buffs on so flawlessly and easily that it's extremely hard to mess up when applying it. And yes, it didn't settle into fine lines or accentuate any pores! Since it's a powder, the product has virtually no scent. As for the design of the foundation, it's much easier less messy due to the ingenious netting feature. 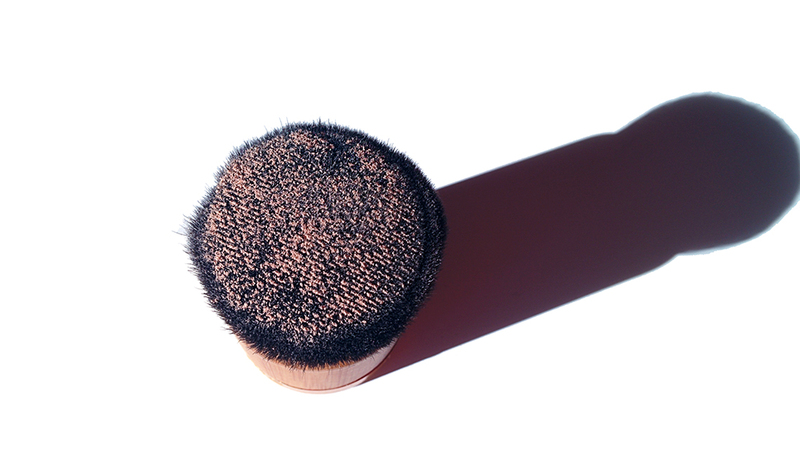 The Airbuki brush was made so that the diameter of the brush fits perfectly within the net. It also picks up quite a lot of product since the brush is so dense, but it disappears almost immediately when you buff it onto the skin. Is the Airbuki brush a necessary item? I tried applying the foundation with another brush, but the Airbuki brush is the ideal brush for this foundation given its size and ease of application. 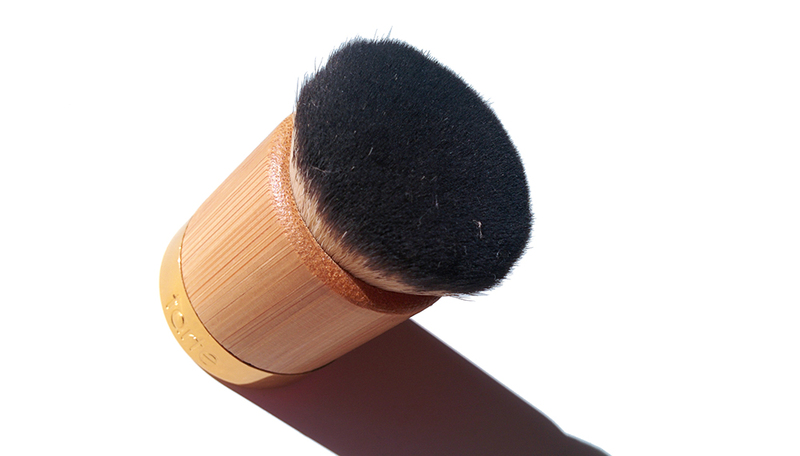 However, I think any densely packed flat top kabuki brush would do as well if you already have such a brush. The foundation does have fine shimmer particles in it, but on the skin it's not that noticeable. You do need to buff on several layers if you want to achieve medium to full coverage. If you want light coverage, one layer is enough. 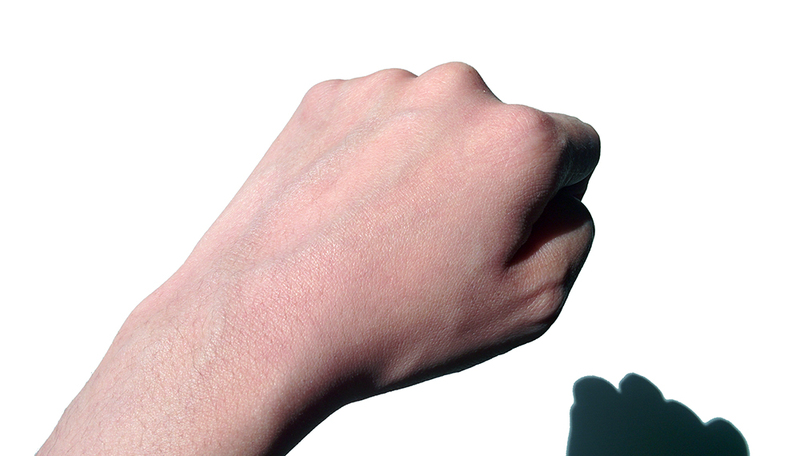 As you can see from the swatch on my hand, it's almost imperceptible on the skin. The wear-time was very generous and I was able to go a whopping 10 hours with this on although it did start to crease around my smile lines like all foundations. Still, given the length of time, it still looked pretty good! You like mineral or powder foundations. You have combination to oily skin. 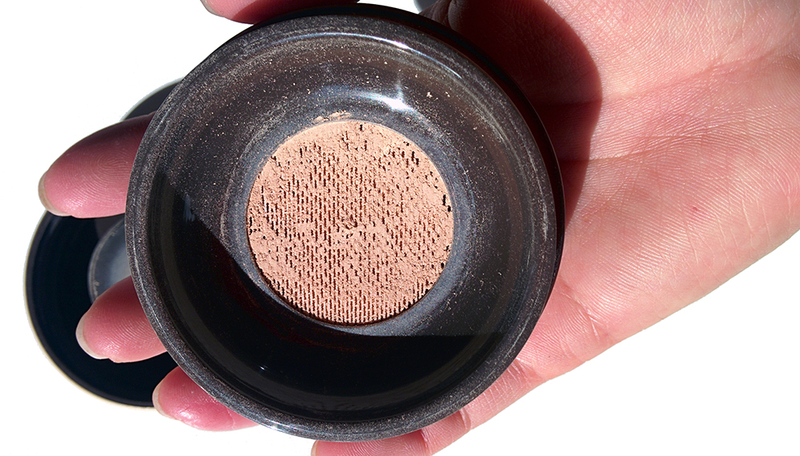 You want a powder foundation that doesn't settle into fine lines. 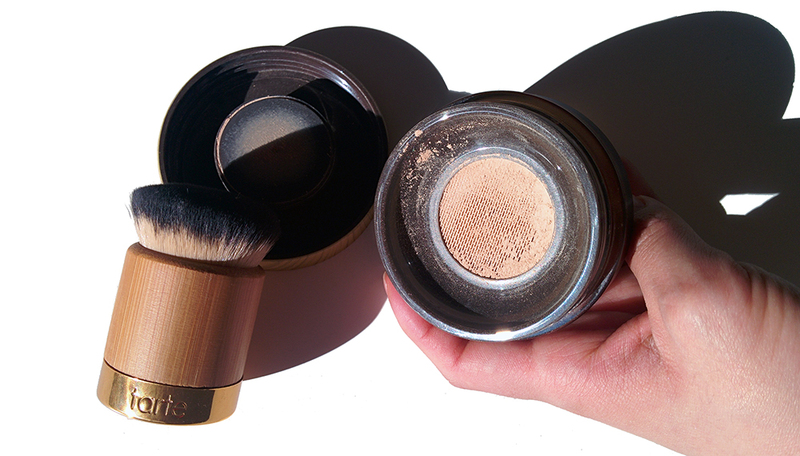 You want an easy to apply powder foundation. You want a foundation that can range from light all the way to full coverage. You want a semi-matte airbrushed finished look. You have noticeable dry patches on your skin. You don't like fine shimmer particles in your foundation. I'm absolutely in love with this foundation! It's so easy to apply and looks very natural on the skin. I also have to give the Tarte Airbush Foundation bonus points for being travel friendly since one, it's a powder, and two it's not messy because of the net. Love, love, love, and can't recommend it enough!